On Sunday afternoon under maximum security arrived to Luxor the lost Quartzite eye of Amenhotep III statue. The story begun in 1970 when the Swiss mission working at the site of the memorial temple of Amenhotep III on the West Bank at Luxor discovered a colossal quartzite statue of the king. Around 1973, the statue was badly damaged by fire. Sometime after this, the left eye was smuggled out of Egypt. It was sold by the Galerie Nefer to Norbert Schimmel, then by Schimmel through Sotheby’s to a German collector. 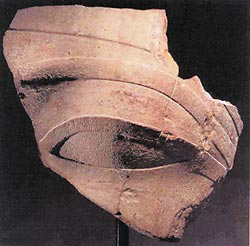 The private collector loaned the eye to the Antikenmuseum Basel und Sammlung Ludwig for display, where it was noticed by Egyptologist Hourig Sourouzian, who identified it and brought it to the attention of the SCA. The director of the Antikenmuseum Basel und Sammlung Ludwig, Peter Blome, brokered its voluntary return to Egypt. A formal Donation Agreement was finalized and signed in September of 2008, and Dr. Abdel-Hamid Maarouf travelled to Switzerland in October, 2008 to bring back the Eye. The eye was received by the Egyptian Museum in Cairo till it was decided to be sent to Luxor and re-attached to the statue.